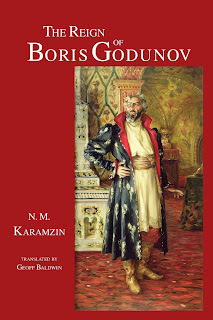 To the extent that people are familiar with Boris Godunov at all, it is usually through Musorgskii's opera of that name. Many will be surprised to learn the he was an actual historical character. Indeed: he ruled Russia from 1584 to 1605, first as regent, later as tsar. He was a consummate political operator and a fascinating character - a bit like a real-life Macbeth. "Nicholas Karamzin (1766-1826) was Russia's first professional historian. His twelve-volume History of the Russian State which came out serially between 1818 and 1829 was the first work to acquaint Russians, who had just defeated Napolen's armies, with their traditions. It has bever been translated into English. Mr. Baldwin has undertaken the formidable task of filling this gap. The Reign of Boris Godunov, the story of Russia's ruler at the end of the sixteenth and beginning of the seventeenth centuries, is an excerpt of this massive publication. The translation is both accurate and fluent and should give readers a rare glimpse into Russia's remote past." In the future this site will have ancillary material and a moderated discussion.